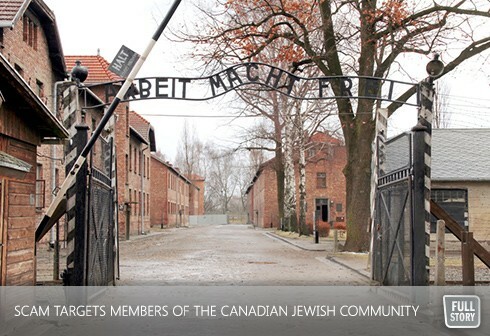 The Centre for Israel and Jewish Affairs (CIJA), UJA Federation of Greater Toronto’s advocacy partner, recently learned of a scam targeting the Canadian Jewish community and Holocaust survivors. A letter is being circulated to the Jewish community purporting to have found dormant Swiss accounts containing seventy-five million dollars belonging to Holocaust victims. The letter requests people’s personal and contact information in order to facilitate the transfer of funds. This is an obvious attempt to defraud members of the Jewish community and should be ignored. Local community professionals across Canada were made aware of the scam by recipients of the letters and subsequently referred the matter to CIJA. CIJA advised our affiliate organization, Canadian Jewish Holocaust Survivors and Descendants (CJHSD), of the scam and assisted them in circulating a letter to local Federations, community professionals, and rabbis, with a view to warning anyone who might be targeted by this scam. Please share this information with your Holocaust Centre, local survivor associations, and any others you feel would benefit from knowledge of this deception.